Most managers prefer to use a supportive leadership style that encourages direct reports to seek out their own solutions in accomplishing their tasks at work. But that style is only appropriate when the direct report has moderate to high levels of competence and mostly needs encouragement to develop the confidence to become self-sufficient. What about the other times when people are brand new to a task, disillusioned, or looking for new challenges? In these three cases, just being supportive will not provide people with the direction they need to succeed. In fact, just being supportive will often delay or frustrate performance. The best managers learn how to tailor their management style to the needs of their employees. For example, if an employee is new to a task, a successful manager will use a highly directive style—clearly setting goals and deadlines. If an employee is struggling with a task, the manager will use equal measures of direction and support. If the employee is an expert at a task, a manager will use a delegating style on the current assignment and focus instead on coming up with new challenges and future growth projects. Are your managers able to flex their style? 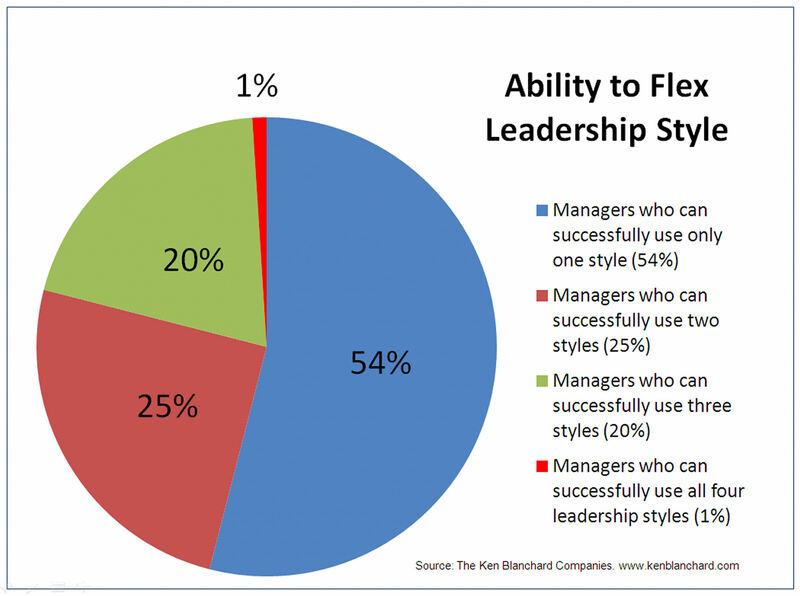 Research by The Ken Blanchard Companies shows that leadership flexibility is a rare skill. In looking at the percentage of managers who can successfully use a Directing, Coaching, Supporting, or Delegating style as needed, Blanchard has found that 54 percent of leaders typically use only one leadership style, 25 percent use two leadership styles, 20 percent use three leadership styles, and only 1 percent use all four leadership styles. Create a written list of goals, and tasks for each direct report. Schedule a one-on-one meeting to identify current development levels for each task. What is the employee’s current level of competence and commitment? Come to agreement on the leadership style required of the manager. Does the direct report need direction, support, or a combination of the two? Check back at least every 90 days to see how things are going and if any changes are needed. Leading people effectively requires adjusting your style to meet the needs of the situation. Learning to be flexible can be a challenge at first—especially if you have become accustomed to using a “one size fits all” approach. However, with a little training and some practice, you can learn how to accurately diagnose and flex your style to meet the needs of the people who report to you. And the best news is, even while you are learning, your people will notice the difference. Get started today! June 18, 2012 in Behavior Change, Best Practices, Coaching, Cost of Doing Nothing, Employee Productivity, Goal Setting, Performance Management, Research, Situational Leadership II, Talent Management. A great point about the need to adapt. In addition John Spence would also say that if we tolerate mediocrity we become a magnet for it. Some ‘supportive managers’ may fall for the trap of being adaptive to the point of accepting poor performance. I am sure you aren’t advocating this but when the majority of staff hear the boss say we are going to paint the fence next week and 80% don’t believe it will happen for a variety of reasons we need to change that belief. I get nervous when considering adaptive management but accept it’s importance.